There are many fantastic islands found along the Queensland Coast. With the Great Barrier Reef on one side and Airlie Beach on the other, the Whitsundays Islands are the true jewels in the reef. There is a wide range of accommodation and activities for all budgets. From the luxurious resorts of Hayman Island and Beach Club on Hamilton Island, to secluded adult getaways at Peppers Palm Bay, through to family focused island resorts like Hamilton Island and Daydream Island. 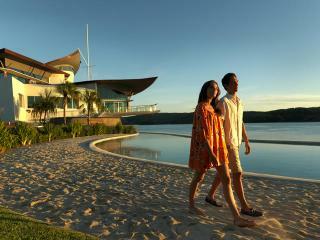 Daydream Island Resort & Spa is a tropical paradise perfect for families and couples. Located in the magnificent Whitsundays, Daydream Island offers the complete range of island facilities and holiday accommodation. The Daydream Rejuvenation Spa, open air cinema, National Park and 19 hole mini golf course are just some of the fantastic options available. Families have plenty of options with a kids club, babysitting and loads of family friendly activities all across the island. 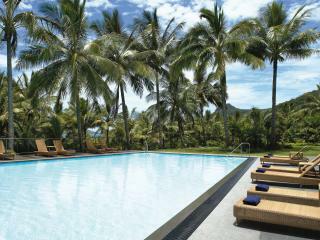 Hamilton Island Beach Club provides a relaxing holiday experience in the privacy of this absolute beachfront resort. Renowned for its beachfront views and contemporary, luxurious rooms this boutique hotel features an infinity edge pool, Club Lounge and Bar, VIP buggy chauffeur service, 24 hour reception and restaurant. The Beach Club is an adult's only resort allowing you to relax and indulge in the best the Whitsundays have to offer. Throughout Hamilton Island there is a number of self-catering, individual accommodation ranging from apartments to houses that sleep up to 8 people. Each is situated in their own grounds but generally share a swimming pool and landscaped gardens. Styles vary in price and include studios, two storey and split level accommodation. Hamilton Island holiday homes require a minimum 3 night stay and include a complimentary 4-seater buggy. Palm Bungalows are located near the Resort Centre, restaurants, swimming pool and Catseye Beach. Affordable island accommodation at its best, Hamilton Island's Palm Bungalows offers private free-standing bungalows surrounded by tropical gardens and feature their own private balcony with exotic garden views. Whether you want to enjoy a romantic escape or a peaceful and relaxing Hamilton Island holiday, Palm Bungalows are a spacious and secluded island haven. Reef View Hotel is renowned for its breathtaking views of the Whitsundays. The upper floors feature a range of luxury suites including the Reef Suites, 1 and 2 bedroom Terrace Suites and the plush Presidential Suites. 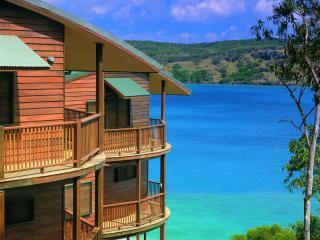 Each suite has its own private balcony overlooking the Coral Sea and the spectacular Whitsunday Passage. The lower floors are home to spacious, modern rooms with contemporary furnishings and garden or Coral Sea views. On site facilities include a bar, restaurant, shop and swimming pool, making Reef View Hotel one of the most sought after accommodation options on Hamilton Island. Offering the luxury of hotel facilities like housekeeping and movies on demand with the home-away-from-home feeling of a full size kitchen, Whitsunday Apartments are a popular accommodation option for families and couples holidaying in Hamilton Island. These self-catering apartments offer landscaped gardens as well as a pool and spa giving you the independence to enjoy your Hamilton Island holiday with all the mod cons of a hotel or resort. Hayman Island is the most northern island in the Whitsunday Islands group. 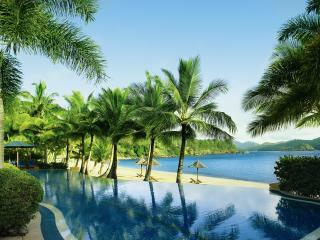 Renowned for its elegance, service and superior location in the Great Barrier Reef, Hayman is a unique 5-star resort. With over a dozen different room types to choose from, the accommodation on Hayman Island will suit every taste.